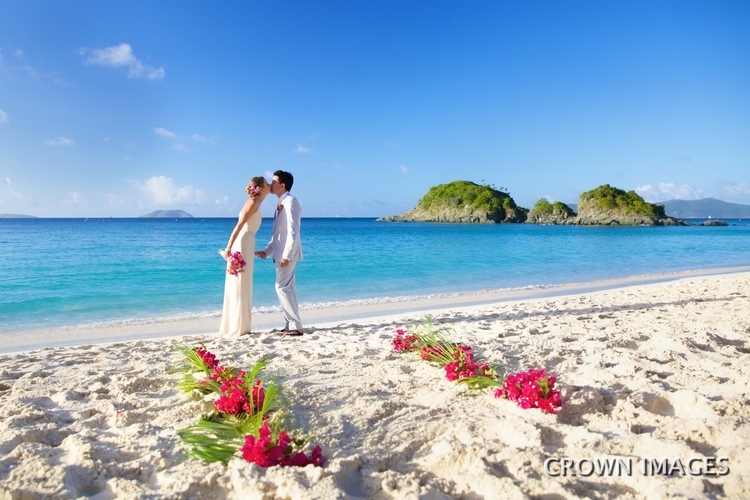 Saint Thomas has many wonderful locations for a destination wedding to choose from. Here are a few of our most popular beaches that are just perfect for a wedding ceremony. Magens Bay Beach is the most popular and largest beach on St. Thomas. It's located no the north side of the island. This location also has a beautiful palm tree forest that is perfect for photos. Lindquist Beach, also called Smith Bay Beach, is located on the east side of the island. The light first thing in the morning is really amazing for that true Caribbean look. This beach is small so it is best to get to the beach early for photos. Sunset weddings at Lindquist are also beautiful. Lime Tree Beach, also called Bluebeard's Beach Club, is located on the south side of the island. This beach is a great location for photos both in the morning and evening. You will see the sun set from this beach because it faces west. This beach has short palm trees right on the beach that are great for photos and beautiful volcanic rocks. It is a short drive from the cruise ship docks and almost never too crowded. Saint John has many amazing beaches, beautiful villas, churches, and historical ruins for a wedding ceremony. Here are just a few of my favorite locations on St John for a wedding. Hawknsent Bay Beach is one of the first beaches on the North Shore Road is perfect for a morning ceremony. Trunk Bay Beach is the most popular beach on St John. It's beautiful first thing in the morning if you can get there before the crowds and the most popular location for a sunset wedding. The old stone ruins at Annaberg are well worth the drive if you're looking for something different from your typical beach destination wedding.